Rev Rachel Webbley, is the primary officiating minister at The Endowed school. She is the Team Vicar of St Alphege Church, Whitstable, in the Whitstable Team Ministry, part of the Diocese of Canterbury. ‘Hello! I am a governor and now a parent. 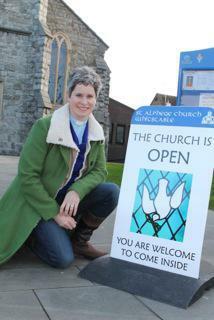 It is great to have such a well-established link between The Endowed and St Alphege Church. We are part of the Whitstable Team Ministry and every week I or one of my colleagues lead school collective worship. Being right next door means that it is easy for the children to have their end of term services in the church and to visit on other occasions; for example the annual ‘Experience Easter’ project. We know that it is important that children of all faiths and none find space to explore and gain a language to talk about their spiritual lives. We build community through sharing communication in our weekly newsletters, websites and social media; and are also linked with all the other churches in the town through Churches Together in Whitstable. I am currently enjoying facilitating stronger links with The Endowed and St Alphege CE Infant school and also sharing on Diocesan projects, such as the new outdoor reflective spaces in both schools and hope to develop interfaith conversations too. I’m available when anyone in the school community needs someone to talk to or pray with. Feel free to get in touch or pop in to the church or prayer garden.